“Indiana Jones and the Kingdom of the Crystal Skull”(KOTCS) was released last year to less than enthusiastic reviews by both fans and critics. The plot revolved around crystal skulls, Mayan end of the world predictions, and aliens. There are several crystal skulls in the world that folks have varying degrees of thought on. The ones represented in the film are alien skulls that are shown with full crystal skeletons in the final scenes of the film. As part of the promotion of the now defunct IJ line, Hasbro offered a mail away offer. 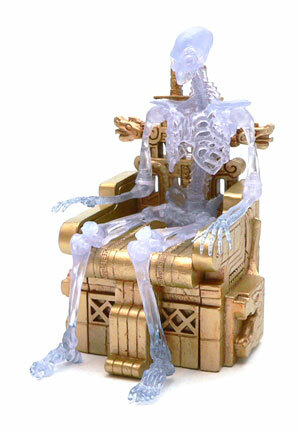 Send in proofs of purchase and they would send you a Crystal Skeleton figure with a throne. I waited until almost the last day to send mine in. I suspect a number of people did, as figures were on clearance around the time making it cheaper and easier to get multiples of the skeleton. I don’t normally mention packaging, but I will in this case. The crystal skeleton ships in a fairly large box. 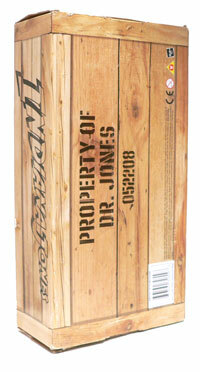 The outside is decoed to resemble a crate with stenciling on it. Pretty nifty stuff, and something you don’t see much of when it comes to mail away premiums. There was no tape on my box, however. If there was any paperwork in the box it was gone before it arrived at Chez Nerd. Out of the box, the skeleton is fairly impressive. It’s done in translucent blue with no paint aps. It’s probably one of the better looking skeleton figures I’ve seen in this scale. Speaking of scale, I was in the family room when I opened Skelly with no other figures in sight. When I sat down to take the pictures of this guy, I realized how much bigger he is than a regular figure. It’s probably correct, but it surprised me a bit. The skeleton is mostly human looking. The most notable exception being the funky inter-connected rib cage. I’m a little unsure how I feel about the knee caps. Yeah, I know they are there, but these look a tad odd when he’s seated. Crowning the top of the cervical vertebrae is, of course, a crystal skull. The skull is where alien weirdness shows up the most. The eye sockets are more squarish and the back of the head is elongated a bit like an alien from “Alien”. 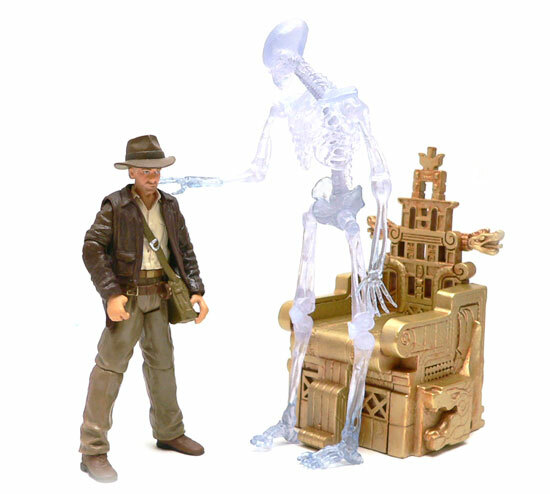 Comparing it to the crystal skull hand that Indy came with yields quite a bit of differences in scale and shape. The Indy skull comes off looking more like a Conehead skull when you put them side by side. The articulation in this guy took me a bit off guard. Normally in a figure this spindly, you get very limited articulation. Skelly here is has ball jointed hips and shoulders. Knees and elbows are there to help posing him in the throne. The head and waist seem to be more of cut joints than ball joints, but still suit their purpose. The throne is a pretty nice set piece. I’m really pleased to see Hasbro stepping up their game when it comes to diorama pieces. This is one of the nicer Indy pieces. Way better than the temple trap stuff. If the entire KOTCS line had been executed this well, the line may have stayed around longer. For a mail away figure from a line that failed to live up to expectations, Skelly here is a pretty nice figure. Now, I know you won’t have him fighting Germans side by side with Indy. But, he’s no less deserving of a figure than the Grail Knight. 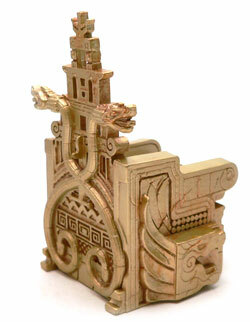 The execution of the figure and the included throne are well done, probably better than most of the KOTCS figures. 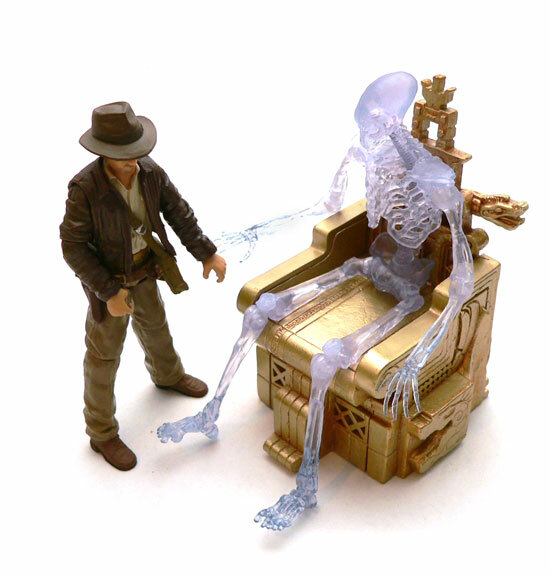 If you missed the Indiana Jones figures from Temple of Doom order them now from Entertainment Earth!